Bienvenue to San Diego’s most elegant hotel landmark, where French elegance and warm San Diego friendliness set the scene for treasured memories and unique experiences. Welcome to your home away from home, a uniquely palatial sanctuary on the edge of San Diego’s Gaslamp district. Designed to meet the highest standards of European hospitality, each of our generously sized rooms basks in floor-to-ceiling views of downtown San Diego and beyond. Think: luxe décor and all the character-filled charm that comes from a respected heritage. Indulge, savor and relax and enjoy the comfort of your own expansive abode. 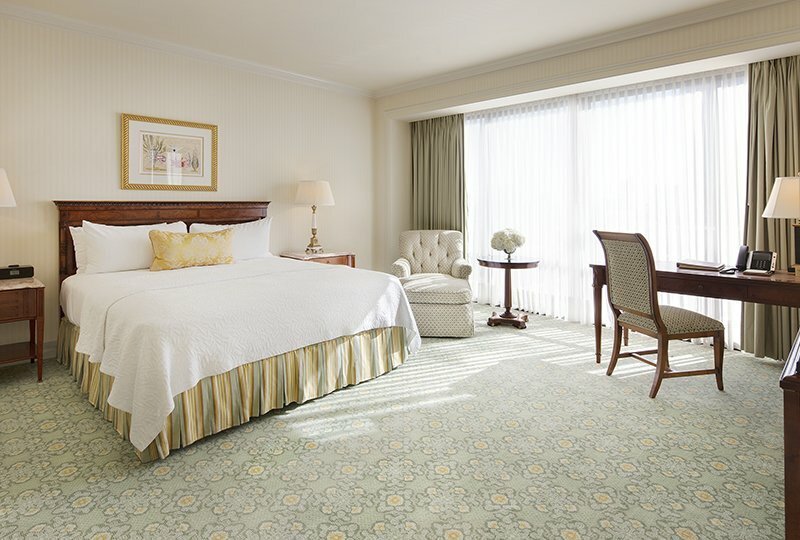 Located between the hotel’s 4th and 10th floors, each of our 400 square-foot deluxe rooms has been finished to exceed The Westgate’s historically high standards. 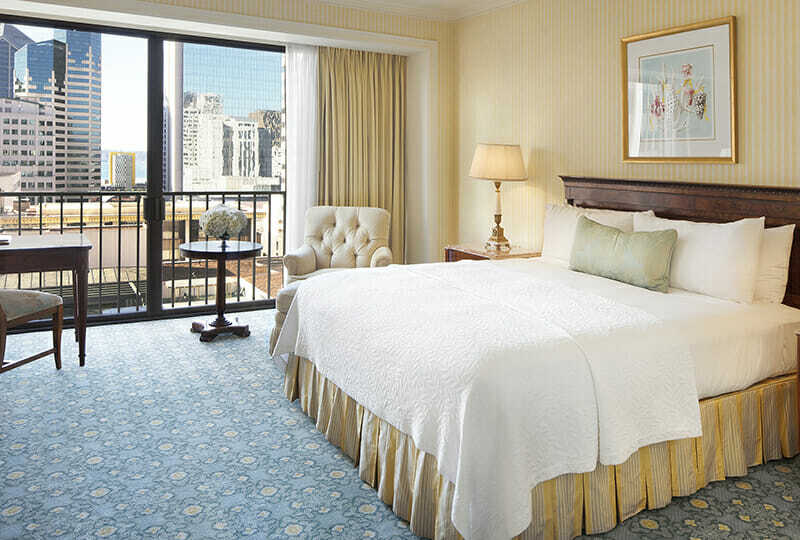 Enjoy San Diego’s sun-filled skies and a view of downtown from your personal step-out balcony as well as a host of lavish interior features including rich carpeting, luxury bed linens, generously proportioned furniture and unique imported European furnishings. 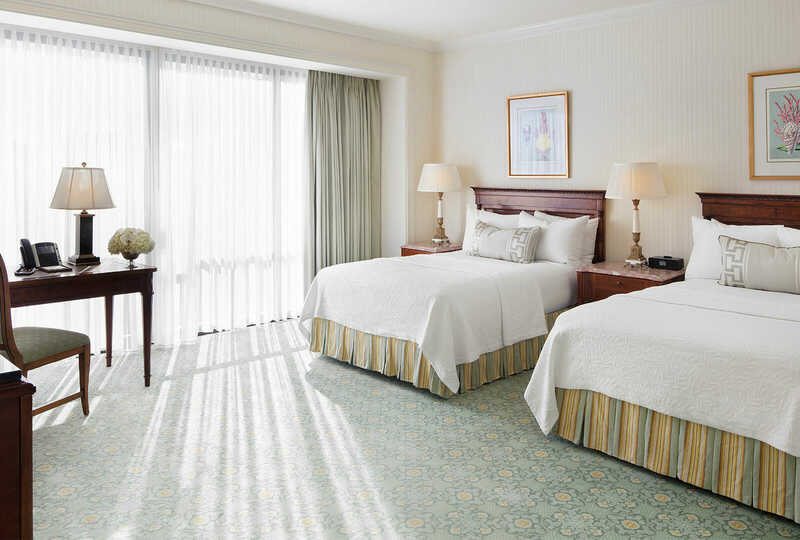 Set between the 11th and 18th floors, our premier rooms enjoy uninterrupted views of San Diego and historic Balboa Park. Relax within 400 square feet of elegantly appointed surroundings featuring generously proportioned imported European furniture, luxury bed linens, rich carpeting and a view of downtown from your personal step-out balcony. 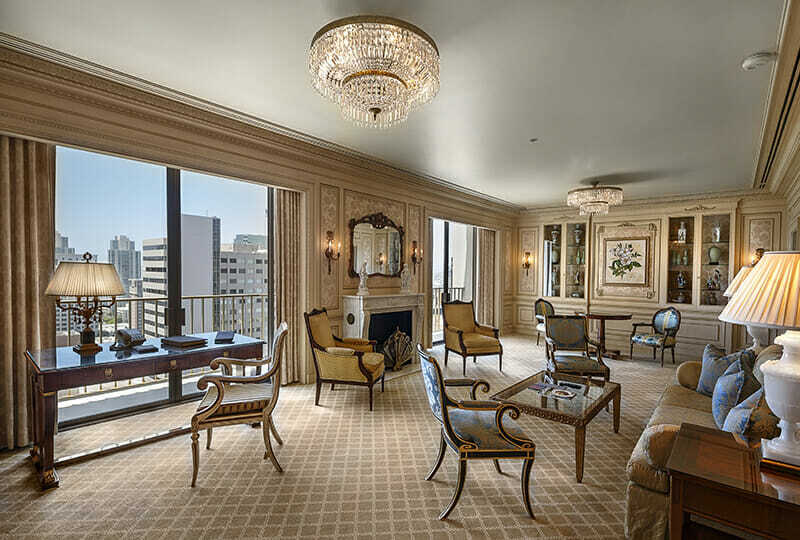 Boasting expansive living areas, generous bedrooms and the unique, charm-filled ambiance of palatial European living, our Presidential, Governor’s, Royal and Executive suites will transport you to a place of relaxed refinement. Featuring opulent décor, imported European furniture and antique furnishings, this is pampered privacy at its most effortless and elegant. Generously sized up to 1,500 square feet, our suites come complete with luxury bed linens, down comforters and private terrace. Located between the hotel’s 4th and 10th floors, each of our comfortable and accessible guest rooms has been enhanced to exceed expectations. Echoing the beloved beauty of the French châteaux our interiors were modeled after, our guest rooms combine time-honored elegance and charm to create the perfect hotel setting. As timeless French furnishings create a peaceful escapist atmosphere, chic touches and attention to detail make any length of stay especially cherished. Check-in time is 3 pm. Check-out time is 12 pm. What are The Pool at AquaVie hours? AquaVie pool hours are Monday to Sunday 5 am to 10 pm. Weather permitting. Hours of pool are subject to change or restriction. What parking is available at the Westgate Hotel? We offer 24-hour valet parking for hotel guests and guests of our dining outlets. Fees and restrictions apply. Overnight parking is $40 for hotel guests. Daily maximum parking rate is $45. For shorter visits, the first hour is $12, while every additional 30 minutes or part thereof is $6.00. The Westgate Room, Plaza Bar, Sunday Brunch and Afternoon Tea validate parking for three hours at a charge of $10.00, after which a fee of $8.00 per hour or part thereof applies. A different rate may apply during The Westgate Hotel special events. There is no self-parking available.  Cancellations for a hotel room or suite reservation must be received 24 hours (48 hours for suites) before the expected day of arrival and may differ by arrival date and room type. If cancellation of a guaranteed reservation is not received by the required date, the hotel will charge for one night’s accommodation. For details of cancellation policies and deposit requirements, please check at the time of booking. Do you offer cribs or roll-away beds? We offer complimentary Pack ‘n Plays. Please request a Pack ‘n Play during the booking process or contact guest services at 619-238-1818. We offer roll-away beds for $20 for duration of stay. Where can I take my laundry? The Westgate Hotel offers dry cleaning and laundry services. Please place your garments in the plastic bag provided in your room along with a laundry request form. Laundry request form shows service options and pricing. Please notify housekeeping for collection. We can press items without sequins or heavy ornamentation. An iron and ironing board is provided in each guest room. Our Guest Services Department is here to assist you with your transportation needs. Please contact us at 619-238-1818. With the exception of Assistance Animals, The Westgate Hotel does not allow pets in guest rooms. Our concierge staff is happy to assist you in locating a suitable boarding facility near the hotel. Can special amenities such as champagne and flowers be prepared for guests before arrival? An extensive range of beautiful welcome gift baskets featuring champagne, flowers and chocolates are available by calling 619-238-1818. Where is the front of the hotel? The main entrance to The Westgate Hotel is located on Second Avenue. During daylight hours an additional access point is located on the Plaza Courtyard. Valet parking is located in front of the main entrance. Where is the AquaVie Fitness Club? The AquaVie Fitness Club is located adjacent to The Westgate Hotel. It can be accessed from the Plaza Courtyard or from 234 Broadway. Where are the ice machines or coffee stations? There are no ice machines or soda machines on any of the floors. For ice, please call room service for delivery. Coffee is available 24 hours a day through room service. California law prohibits smoking inside public spaces. Guests can smoke on the Fountain Terrace on the third floor, or on the ground floor Plaza Courtyard. Where can I mail a letter or package? A mailbox is located on Second Avenue. There is a U.S. Post Office located across the street in Horton Plaza. There is an ATM in the Grand Lobby. Parties of eight or more will receive an 18% service charge added to the check. Enjoy a night away in the grandest of European traditions, complete with breakfast. Stay for the night with our special Bed & Breakfast rate and we will credit you with $50 for a breakfast of your choice, either in-room, poolside or in the beautiful surroundings of our landmark Westgate Room restaurant. Book direct and save $20 daily access fee.